Every July the coastal areas of Florida are flooded with lobster hunters trying to get their share of this year's bounty, when the official mini lobster season kicks off. There are two Florida Lobster Seasons, the 2 Day Mini Season and the 8 month regular lobster season. The mini lobster season is always the last consecutive Wednesday and Thursday in July. Make sure to always verify dates and regulations with Florida Fish and Wildlife. It begins at 12:01 am on Wednesday and ends at 12:00 midnight on Thursday. The regular 8 month lobster season is always August 6 through March and is open to both recreational and commercial fisherman. Commonly referred to as the Florida Spiny Lobster, the Caribbean spiny lobster inhabits tropical and subtropical waters of the Atlantic Ocean, Caribbean Sea, and Gulf of Mexico. 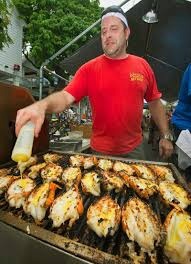 Lobster is a famous Florida Keys seafood specialty. Spiny Lobsters are different than their distant relative, the Maine or North Eastern Lobster. Since the Spiny Lobster has no claws, meat is located in the tail of the animal and is delicious whether prepared by itself with melted butter or in creations like lobster salad, ceviche or a Lobster Benedict. 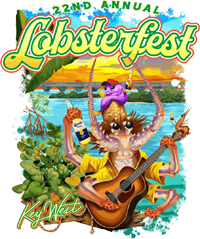 Street Fare - Arts, Crafts and LOBSTER!!!!!! !